I was hesitant to share this with you all, but as I’ve been preaching all year long, we are trying to forge a family culture that is transparent and that lets one another into each others’ lives., whether we have good news or bad news to share. While last week, I was named All-Area Boys Tennis Coach of the Year by both Pasadena Sports Now (first time) and Pasadena Star News newspapers (4th time – 2 girls, 2 boys), it wasn’t something I was planning to exactly share here. Maranatha had never really been thought of as a tennis school. That was until the arrival of coach Arthur Hsieh, who runs both the boys and girls programs. Coach Arthur Hsieh at CIF Finals with Matthew Alleman. The girls program won a CIF title a couple of years back. The boys team, though, hadn’t been a championship caliber squad before Hsieh, and there was no reason to believe the 2017 season would be any different. But there was one person who did believe bigger things were possible. That man is 49-year old Arthur Hsieh. He led his Minutemen to the title match in the CIF-SS Division 4 playoffs, which was the first time the boys program had ever made a championship appearance. Top seeded Los Osos defeated Maranatha, 11-7, but the bar has risen drastically thanks to their coach. More importantly, if you speak to any of his athletes, Mr. Hsieh impacts their lives much deeper and greater off, than anything that happens on a tennis court. 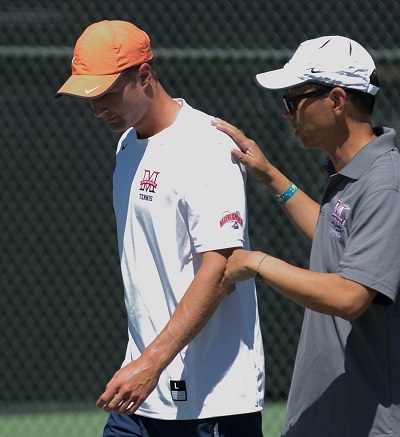 For his unwavering support of his players, his being a role model as a standup adult figure, and his success this season, Arthur Hsieh was named the Pasadena Sports Now Boys Tennis Coach of the Year. Maranatha was 17-2 this season and won another Olympic League title. It was their fifth league championship in his five years at the school, and their overall record in league play over that time is 43-1. Interestingly enough, Hsieh met John Wooden when he was 88 years old and struck up a conversation with the UCLA basketball icon. As the event he was attending was about to start, Hsieh asked Wooden if it would be possible to continue the conversation another time, and to his delight, Wooden said he would love to, and they became friends. John Wooden died in 2010 at the age of 99, but his books on success and life story have impacted thousands, including Arthur Hsieh. “I tried to use ‘Woodenisms’ with my players, because they don’t just impact you as an athlete (or coach), they are keys to success in life,” Hsieh said. One of the lessons he learned really stuck with his players. Hsieh is a deeply religious and moral man, and while that might not be everybody’s cup of tea as a coach, he is a perfect fit at Maranatha and has bettered the lives of all these young student-athletes he’s had the joy of coaching. But it all starts at home. Hsieh has a remarkably close, intelligent and beautiful family. Next week, he and his wife Sandra will celebrate their 27th year of marriage. Sandra also does her part in making both the boys and girls programs excel. Nathaniel (24), Randall (22), Daniel (20) were all athletes in their day, as is 17-year old Angela, who plays No. 1 singles for her father in the girls program. 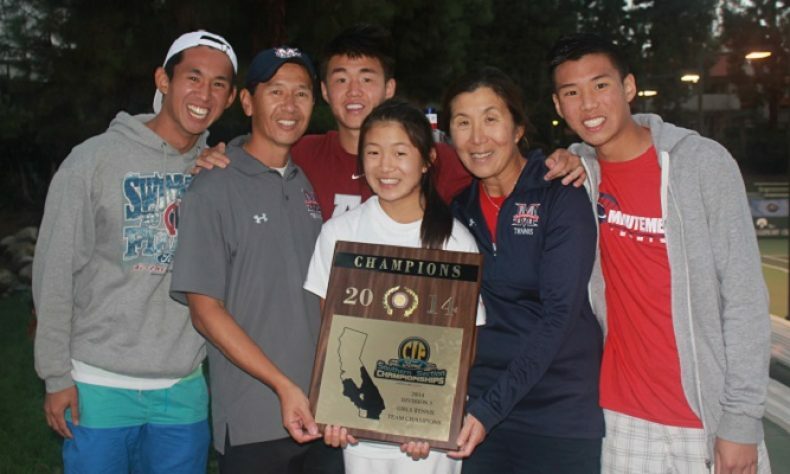 His daughter has another year at Maranatha that Hsieh will serve as head coach, and then the future is going to be a year-by-year decision in what he does with the program. But for five years, Maranatha has been lucky to have a man that is as quality a person as he is a coach. Regardless of when he steps off the courts, Hsieh’s lessons on life will reverberate through his players throughout their lifetimes. This year’s CIF finals run has been built on the shoulders of those who fell short in prior years. We have seen the run coming and it couldn’t have happened for a better group of young men. The entire Maranatha community is thankful for the excitement this year’s team brought to campus. They have left an indelible mark in the history books of the program and raised the bar for future teams to reach. Don’t you love kids? I do. There is this raw, real, unpolished, unpretentious, unpackaged authenticity and realness to them, for better or for worse! 🙂 I also love young spiritual children as well (though they may be chronologically older, even adult-aged). They too can have that wide-eyed hungry (even naive), teachable way about them that is refreshing and alive. I love being around real life like that. But with having children (biologically or spiritually) comes an enormous amount of spiritual responsibility. 4 “Hear, O Israel! The Lord is our God, the Lord is one! 5 You shall love the Lord your God with all your heart and with all your soul and with all your might. 6 These words, which I am commanding you today, shall be on your heart. 7 You shall teach them diligently to your sons and shall talk of them when you sit in your house and when you walk by the way and when you lie down and when you rise up. 8 You shall bind them as a sign on your hand and they shall be as [b]frontals [c]on your forehead.9 You shall write them on the doorposts of your house and on your gates. There they were, my marching orders from the Commander Himself. My duty and calling as the father to my children was to first and foremost teach and train them to walk with the Lord, even before my responsibilities to train and take care of them physically, socially, academically, etc. I have been charged to constantly bring them before the voice, heart, desires, and will of our God Almighty, through the priceless gift of His matchless Word; and I am to do it passionately, authentically, creatively, and in heavy doses. Every chance that I get. Waking. Sleeping. Walking. Playing. Eating. Talking. Traveling. Every chance that I get. That was really the underlying impetus behind us homeschooling them. That’s why I get so excited when I see a young couple like Robert and Kathy take that charge to heart as well, as they begin exposing their daughter to God’s Word at her young age (these pics are the first pics of Hannah “doing” Bible study 🙂 wink, wink). They know that even though she’s the cutest little thing (did you see her last night??? Sooooo cute! ), God’s Word tells us the truth: little Hannah is a born-sinner, depraved at her core. Little Hannah needs a Savior and needs to come to Jesus and to grow in His grace. And that cannot happen without the power of His Word. And you cannot grow in grace without the power of His Word either. Deuteronomy 6:4-9 applies to YOU. YOU need to talk of His Word when you sit in your house and when you walk by the way, and when you lie down, and when you rise up. YOU need to bind them as a sign on your hand and as frontals on your forehead. YOU need to write them on the doorposts of your house and on your gates. As a spiritual father to some of you, and a spiritual uncle to most of you, I charge you and plead with you to examine the life you’re living, who you’re living it with, the way you spend your time, the activities you engage in, the conversations you have, etc. Then, I ask you to do some re-organizing of your life to make more time to study, sit under, meditate on, pray through … God’s Word. Last night in TD, we began to get more clarity and soberness with respect to the spiritual world that we live in. It’s certainly important to understand and get a handle on, for the realm of demons, angels, and the supernatural is real. It would be foolish to ignore. The Bible doesn’t. As we continue in our Who Are You God? series, in this piece, Nathaniel peeks through the curtains and gives us a vivid description of what heaven may be like. It’s a brilliant and moving piece that he wrote when in high school that left me not only more concretely aware of the supernatural realms, but increased my yearnings and desires to know my Destiny more fully. Stunned, I passed by the columns of heaven, glimpsing what appeared to be intensely familiar. I looked again, intently studying the rich marble and the radiant gold lettering. Yes indeed, embedded in the gates of the celestial city were the chronicles and laws of Moses, the laments and warnings of prophets, the cries and songs of David, the miraculous accounts of Luke, the impassioned letters of Paul, and the vivid revelations of John. Scripture, Holy Scripture, indelibly etched into heaven’s eternal gates. Yet my countenance must have revealed my awed bewilderment, for Empyrean, my guiding angel, aptly remarked, “It’s as if you’re stunned to see the Words of life immortalized.” “Stunned alright,” I admit. “Wasn’t the Bible given for our use on earth? I mean, I have just always assumed that being in the presence of God would be enough. There is no need for partial revelation when we are basking in the full light of His glory, is there?” Empyrean strolled along then paused in front of a massive column. “You are wrong, my son,” he affectionately stated, “being in the presence of the Almighty, basking in His light is not enough. It’s more than enough. In fact it is more than any angel or man could ever absorb, process, or know. No, for all eternity I will never cease to revel in and learn from the Holy One.” Those were my thoughts exactly and that was why I was so stunned to see something from the finite realm transcend into the infinite one.